Background: 3,3'-Diindolylmethane (DIM) is a condensation product of indole-3-carbinol, a glucosinolate naturally occurring in Brassica genus vegetables. The antiinflammatory properties of DIM through the inhibition of NF-κB, as well as its ameliorating effects on glucose tolerance and hyperglicemic states, have been described. A subclinical proinflammatory profile resultant from the interaction of adipocytes and macrophages has been reported in obesity, affecting the insulin signaling pathway, contributing to insulin resistance. Objective: The aim of this study was to evaluate the effect of DIM on proinflammatory cytokines and phosphorylation of IRS-1 pY612 and Akt-1/PKB pT308 in an obesity-induced inflammation model. Methods: Differentiated 3T3-L1 adipocytes were co-cultured with RAW 264.7 macrophages and exposed to 20 µM, 40 µM and 60 µM DIM for 24 h followed by 100 nM insulin for 20 min. MCP-1, IL-6 and TNFα were quantified in the supernatant through individual ELISAs. Adipocyte lysates were used to determine the relative expression of the proinflammatory mediators by qPCR, and the phosphorylation of IRS-1 pY612 and Akt-1/PKB pT308 proteins by western blot analysis. Results: DIM significantly (p<0.05) reduced the production and mRNA expression of MCP-1, IL-6, and TNFα in a DIM concentration dependent manner, concomitantly increasing the abundance of IRS-1 pY612 and Akt-1/PKB pT308. Conclusion: Our results suggest that DIM influences the insulin transduction pathway by exerting an antiinflammatory effect. The potential therapeutic benefits of DIM in the treatment of glucose metabolic disorders deserve further studies. Keywords: Diabetes mellitus type 2, glucose, inflammation, insulin resistance, insulin signaling pathway, obesity, phytochemicals. Keywords:Diabetes mellitus type 2, glucose, inflammation, insulin resistance, insulin signaling pathway, obesity, phytochemicals. Abstract:Background: 3,3'-Diindolylmethane (DIM) is a condensation product of indole-3-carbinol, a glucosinolate naturally occurring in Brassica genus vegetables. The antiinflammatory properties of DIM through the inhibition of NF-κB, as well as its ameliorating effects on glucose tolerance and hyperglicemic states, have been described. 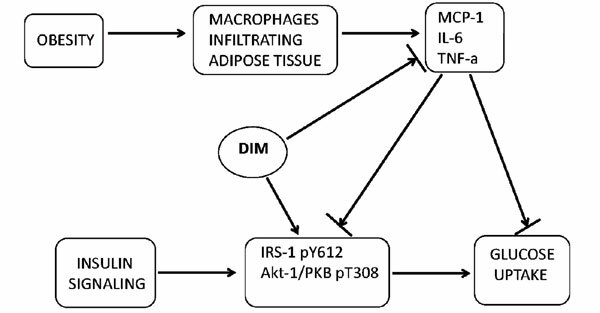 A subclinical proinflammatory profile resultant from the interaction of adipocytes and macrophages has been reported in obesity, affecting the insulin signaling pathway, contributing to insulin resistance.